Traditionally, custom dental restorations required patients to visit Dentistry by Design at least two times. During their initial visit we’d prepare the tooth and plan the restoration, and during the follow up appointment, Dr. James K. Martin placed the custom dental crown, fixed bridge, or other restorative treatment. The CEREC system allows our Dallas dental team to condense this treatment process down to possibly just one appointment. If you’re interested in finding out more about CEREC, contact our team or keep reading. CEREC stands for chairside economical restoration of esthetic ceramics, but essentially, that means a way to quickly and effectively restore damaged teeth in as little as one visit, although additional visits may be necessary. The system is guided by a computer assisted design and manufacture (CAD/CAM) network that combines the entire process into seamless treatment visits. The dental restoration process using CEREC is essentially the same as traditional dental crowns and bridges, but in certain situations, potentially can be condensed into a single appointment. We start by preparing the tooth or teeth by removing and smoothing tooth enamel to adequately support a restoration. 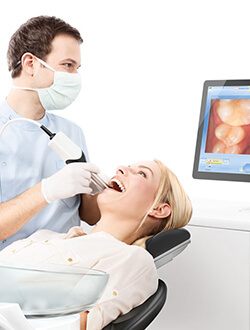 Then, we use the CEREC system to capture digital bite impressions. In addition to capturing these impressions without using the traditional messy, putty-like substance, digital impressions are also much more precise representations and are instantly available on our chairside computers and for our in-office milling unit. Once the impressions are captured, we design the dental restoration, and send the impressions and design to an in-office milling unit where a custom, all-ceramic dental restoration is crafted. Once the restoration is completed, we bond it in place, and patients leave our office with a fully repaired smile.